Drypoint etching, 1936, by Arthur W. Heintzelman, commemorating the Tercentenary of the founding of Rhode Island by Roger Williams. Courtesy of Roger Williams University Archives. 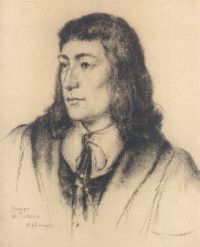 ROGER WILLIAMS was born in London, circa 1603, the son of James and Alice (Pemberton) Williams. James, the son of Mark and Agnes (Audley) Williams was a "merchant Tailor" (an importer and trader) and probably a man of some importance. His will, proved 19 November 1621, left, in addition to bequests to his "loving wife, Alice," to his sons, Sydrach, Roger and Robert, and to his daughter Catherine, money and bread to the poor in various sections of London. The will of Alice (Pemberton) Williams was admitted to probate 26 January 1634. Among other bequests, she left the sum of Ten Pounds yearly for twenty years to her son, Roger Williams, "now beyond the seas." She further provided that if Roger predeceased her, "what remaineth thereof unpaid ... shall be paid to his wife and daughter.. .." Obviously, by the time of her death, Roger's mother was aware of the birth in America in 1633 of her grandchild, Mary Williams. Roger's youth was spent in the parish of "St. Sepulchre's, without Newgate, London." While a young man, he must have been aware of the numerous burnings at the stake that had taken place at nearby Smithfield of so-called Puritans or heretics. This probably influenced his later strong beliefs in civic and religious liberty. During his teens, Roger Williams came to the attention of Sir Edward Coke, a brilliant lawyer and one-time Chief Justice of England, through whose influence he was enrolled at Sutton's Hospital, a part of Charter House, a school in London. He next entered Pembroke College at Cambridge University from which he graduated in 1627. All of the literature currently available at Pembroke to prospective students mentions Roger Williams, his part in the Reformation, and his founding of the Colony of Rhode Island. At Pembroke, he was one of eight granted scholarships based on excellence in Latin, Greek and Hebrew. Pembroke College in Providence, once the women's college of Brown University, was named after Pembroke at Cambridge in honor of Roger Williams. In the years after he left Cambridge, Roger Williams was Chaplain to a wealthy family, and on 15 December 1629, he married MARY BARNARD at the Church of High Laver, Essex, England. Even at this time, he became a controversial figure because of his ideas on freedom of worship. And so, in 1630, ten years after the Pilgrims landed at Plymouth, Roger thought it expedient to leave England. He arrived, with Mary, on 5 February 1631 at Boston in the Massachusetts Bay Colony. Their passage was aboard the ship Lyon (Lion). Roger Williams made two trips back to England during his lifetime. The first in June or July 1643 was to obtain a Charter for his colony to forestall the attempt of neighboring colonies to take over Providence. He returned with a Charter for "the Providence Plantations in Narragansett Bay" which incorporated Providence, Newport and Portsmouth. During this voyage, he produced his best-known literary work -- Key into the Languages of America, which when published in London in 1643, made him the authority on American Indians. Roger Williams was Governor of the Colony 1654 through 1658. During the later years of his life, he saw almost all of Providence burned during King Philip's War, 1675-1676. He lived to see Providence rebuilt. He continued to preach, and the Colony grew through its acceptance of settlers of all religious persuasions. The two volumes of the correspondence of Roger Williams recently published by the Rhode Island Historical Society, Glenn W. LaFantasie, Editor, present an excellent picture of his philosophy and personality. Unfortunately, there was no known painting made of him during his lifetime, although many artists and sculptors have portrayed him as they envision him. 1. MARY, born at Plymouth, Plymouth Colony, August 1633, died 1684; married JOHN SAYLES in 1650; six children. John and Mary Sayles lived on Aquidneck Island and are buried near Easton's Beach, Middletown, Rhode Island. 2. FREEBORN, born at Salem, Massachusetts Bay Colony, 4 October 1635, died 10 January 1710; married first THOMAS HART, died 1671; four children. There were no children of Freeborn's second marriage to WALTER CLARKE, a Governor of Newport. 5. DANIEL, born at Providence, February 1641 "counting years to begin about ye 25 of March so yt he was borne above a year & half after Mercy (Carpenter, Roger Williams), died 14 May 1712; married 7 December 1676 REBECCA (RHODES) POWER, died 1727, widow of Nicholas Power; six children. Sources: Carpenter, Edmund J., Litt.D., Roger Williams, New York, 1909; Anthony, Bertha W., Roger Williams of Providence, RI, Vol. II, Cranston, RI, 1966; Haley, John Williams, The Old Stone Bank History of Rhode Island, Vol. IV, Providence, 1944; Hall, May Emery, Roger Williams, Boston, 1917. Master Roger Williams, A Biography (The Macmillan Company, New York, 1957) by Ola Elizabeth Winslow. Purchase this book. Roger Williams, A Contribution to the American Tradition (The Bobbs-Merrill Company, Inc, Indianapolis and New York, 1953) by Perry Miller. Purchase this book. The Irrepressible Democrat, Roger Williams (The Ronald Press Company, New York, 1940) by Samuel Brockunier. Roger Williams, New England Firebrand (The Macmillan Company, New York, 1932) by James Ernst. The Correspondence of Roger Williams (Brown University Press, Providence, 1988) by Glenn W. LaFantasie. Purchase this book.